You can now register easily online. Find the registration link in the description of each class. Download a PDF registration form to print and mail here. at Vesterheim's Folk Art School! Vesterheim Folk Art School has been nurturing folk artists and encouraging excellence in Norwegian-American folk art for well over fifty years. • Dozens of classes each year with master instructors from Norway and from all across America. • Staff-led folk art study tours to Norway. • An open annual exhibition of Norwegian-American folk art in which artists receive helpful critiques of their work. The Norwegian folk-art tradition reaches back to the days of the Vikings and continues to inspire today. 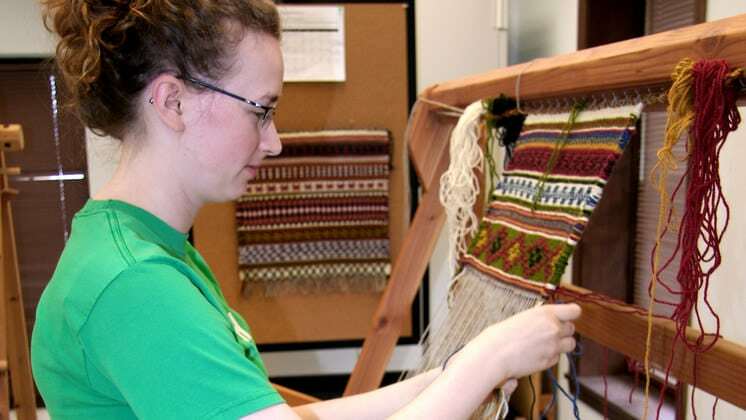 Learning opportunities at Vesterheim reflect the diversity of Scandinavian folk art traditions with classes in fiber arts, woodworking, rosemaling, food, music, jewelry and wirework, metalworking, and knifemaking. The museum’s vast collection of historic and contemporary folk art objects is here to inspire and inform your creativity, as you learn alongside other makers sharing a passion for folk art. We welcome you to join Vesterheim’s creative community for making and learning! The first two classes, held in 1967, were Hardanger embroidery, taught by Carola Schmidt of Decorah, and a rosemaling class, taught by Sigmund Aarseth, from Norway. The folk-art education program grew in 1968 to five classes with 63 students from 12 states. The Gold Medalist program also was born in 1967. The rest is history. A vast number of students are now instructors teaching throughout the United States and other countries. Throughout the years, over 100 gold medals have been awarded in four categories—rosemaling, knifemaking, woodworking, and weaving. Vesterheim’s study tours to Norway offer folk artists a unique learning opportunity based on the museum’s ties and relationships with the artists and institutions of Norway. Participants learn from leading Norwegian artists, surrounded by the beauty and traditions of this inspiring place. The folk-art experience at Vesterheim doesn’t end with classes. Through the National Norwegian-American Folk Art Exhibition, Vesterheim celebrates the past, present, and future of folk art by encouraging and inspiring emerging and established folk artists to develop their craft. This program is vital for promoting folk artists and serves to ensure that these beautiful age-old traditions and skills are preserved. Most Vesterheim classes are held at the museum’s Westby-Torgerson Education Center, 502 W. Water Street, in Decorah. The center houses classrooms, workshops, the Museum Store, a student lounge, the Fladager Reference Library, the Bruening Visitor Center, and offices. 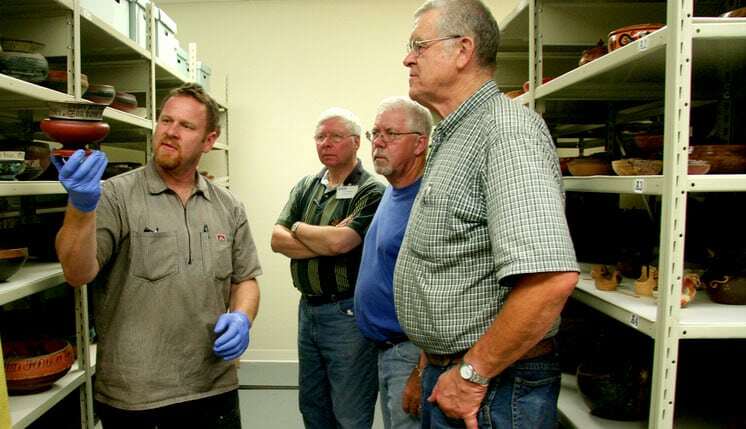 Forging classes are held in the forging shop, next to the Westby-Torgerson Education Center and food traditions classes are held in Vesterheim’s Bethania Lutheran Church basement. The Westby-Torgerson Education Center’s student lounge is located on the third floor. Facilities include a refrigerator, microwave, stove, sink, coffee maker, pop machine, and tables and chairs. There is also a Heritage Park of 12 historic buildings and the outside grounds are open to enjoy any time. There are tables outside the museum’s Main Building for picnics and lounging in the sun. Most classrooms and other facilities in the Westby-Torgerson Education Center are accessible by elevator or ramp. If you have questions or concerns about accessibility, please contact Aaron Burmeister, Folk Art Education Program Assistant, at 563-382-9681, ext. 224, or email at aburmeister@vesterheim.org. Students must make their own housing and dining arrangements. For information about Decorah’s housing and food options check with the Winneshiek County Convention & Visitors Bureau and The Decorah Area Chamber of Commerce. There are many local accommodations offered on airbnb. If you have trouble finding housing, please call Vesterheim at (563) 382-9681 for assistance. There may be other options for accommodations in the area. A short list of private home stays is made available to registered students. A variety of moderately priced restaurants are within walking distance from Vesterheim. The Winneshiek County Convention & Visitors Bureau has information about area restaurants. The Westby-Torgerson Education Center has a student lounge located on the third floor. Facilities include a refrigerator, microwave, stove, sink, coffee maker, pop machine, and tables and chairs. There are also tables outside the museum’s Main Building and there are many near-by parks for picnics. Decorah is just under a 3-hour drive from Minneapolis/St. Paul, Minnesota, and about a 2-hour drive from Cedar Rapids, Iowa. It is approximately 60 miles from La Crosse, Wisconsin, and 80 miles from Rochester, Minnesota, and Waterloo, Iowa. There are various shuttle services that run regularly scheduled shuttles between the Minneapolis airport and downtown Rochester, Minnesota. There are car rental agencies near the shuttle drop-off to continue your trip to Decorah. Hometown Taxi, or 563-382-3155, in Decorah will pick you up at all area city airports, train stations, and shuttle drop-offs with advanced reservations (at least 48 hours). Generally, rides are $1.50 per mile while you are in the car. There is no charge for extra riders. Before each class begins, all students will be emailed a supply list and additional class information. The supply list may include a materials fee for specific items required by the instructor for the class. This fee is paid directly to the instructor at the conclusion of class. Other basic supplies on the supply list should be purchased before class and most are available through the Museum Store. Vesterheim can provide rosemalers with paints, brush cleaner, and painting medium for a $25 palette fee. A basic woodcarving set is available to rent for $25. These supplies must be ordered from Vesterheim in advance. Students might want to bring additional equipment for their own personal needs, a magnifying light for example. Vesterheim’s Museum Store includes everything a folk-art enthusiast needs, whether you are just getting started or have been working at your art for years. You’ll find books and videos on fiber arts, textiles, rosemaling, painting, woodworking, and knifemaking. There are also tools and patterns for woodworking; brushes, paints, and patterns for rosemaling; and beautiful hand-made woodenware ready to decorate. Supplies needed for each class are always available in the store. The friendly and accommodating store staff, led by Ken Koop and Shelley Hendricks, are ready to take and fill your orders in person, on the phone, or through our online store. Located at 502 W. Water St., in the museum’s Westby-Torgerson Education Center, the store is open daily, 9:00 a.m. to 5:00 p.m. Call 1-800-979-3346 with orders and questions. All students receive a 20% discount on purchases made in the Museum Store throughout the duration of any class they are attending. 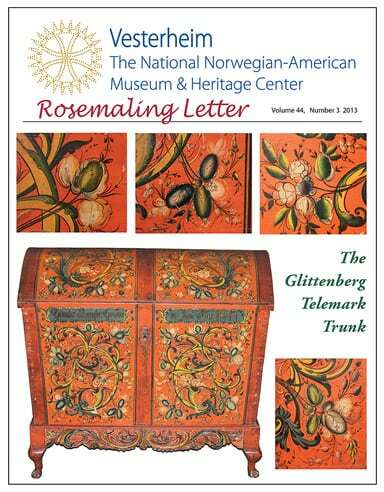 Vesterheim members have the opportunity to purchase the Rosemaling Letter, a full-color magazine sent three times each year. The publication includes articles by other rosemalers about the craft, information about Vesterheim events for folk artists, designs, and pictures of rosemaling pieces from Vesterheim collection and other rosemalers. The class choices at Vesterheim reflect the wide array of Scandinavian folk arts. Check out the current class schedule and register today! Vesterheim’s classes are taught by master instructors from all over America and Scandinavia. These skilled teachers work with students to create a community of learning through hands-on example. Class instruction is held from 9:00 a.m. to 5:00 p.m. unless otherwise noted in the class description. Most classes allow for extra work time in the evenings. All Vesterheim classes are limited in size to assure a quality learning experience. All classes at Vesterheim are open to adults 18 years and older. Vesterheim strongly believes in the importance of keeping our Scandinavian traditions alive by passing them down to our children and nurturing inter-generational learning. Therefore, some courses are open to students under the age of 18. Minimum age requirements are determined by the individual instructors and are included in the course descriptions. Participating youth must meet the “Level of Instruction” requirement for a class. Youth tuition will be discounted 25% according to the member/non-member status of the adult who is enrolling the youth. Vesterheim offers a 50% discount for class tuition on a space-available, stand-by basis to any legal year-round resident of Winneshiek County, Iowa. Students will be notified about availability of an opening in the class one week before the starting date of the class. Discounts do not include materials fees. If local area residents want a guaranteed place in a class, they must pay regular class tuition. Proof of legal residency (Iowa ID or Iowa driver’s license) is required. Tuition for full-time Luther students is discounted 50%, also on a space-available, stand-by basis. All classes have the option of a $50 deposit to register. Full tuition is due 21 days prior to the class starting date. A minimum number of registered students is required for a class to be held. We must meet our minimum number 21 days before class, or the class will be cancelled. If Vesterheim cancels a class, a full refund will be issued. In our efforts to provide a completely fair and equitable enrollment system, we will no longer be allowing transfers of any class registrations/payments from one class to another. If a student wishes to cancel enrollment, a 21-day notice in writing (e-mail is acceptable) is required for a full refund, less a $25 handling fee. Students withdrawing 20 days or less prior to the start date of a class will receive no refund. Vesterheim does not allow videotaping during classes, or auditing a class. Vesterheim is not responsible for the security of property belonging to students and instructors. Smoking is not permitted inside any building at Vesterheim Museum. Alcohol is not permitted in classrooms and workshops with exception of some cooking classes. The use of illegal drugs is prohibited.